Michael Peterson runs his fingers over the peeling bark of a huge madrone burl, one of dozens amassed in the woodlot. The serpentine trunks of Arbutus menziesii are a common sight here in southern Oregon. November through May, loggers haul in the uniquely grained wood by the ton. Most will be milled into veneer – but not all. 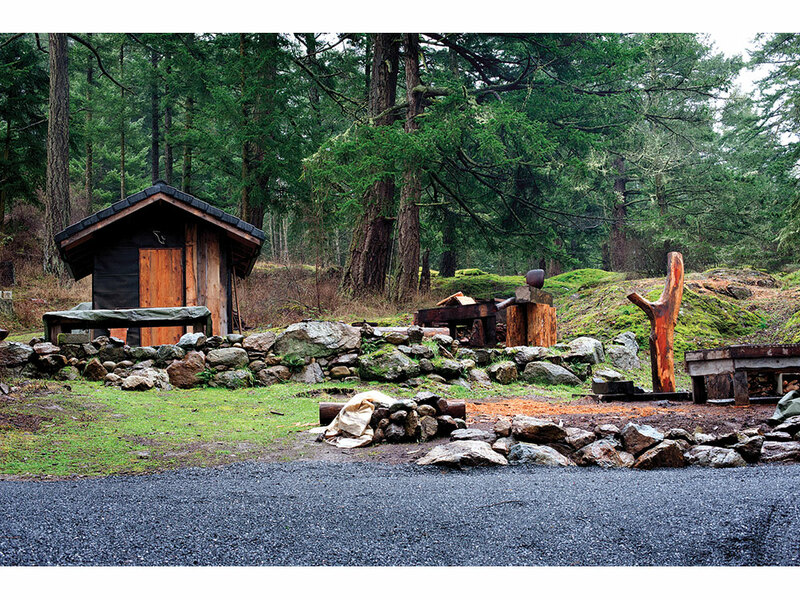 During the season, Peterson and his wife, Jean, return here every couple of months and haul a half-ton of dense green burl back to Lopez Island, Washington, in their old Toyota pickup. 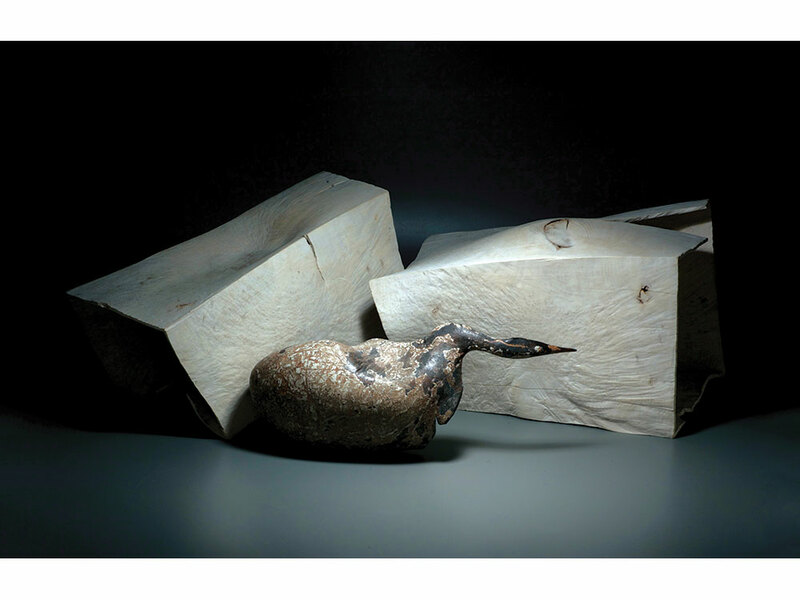 When he finds a piece that speaks to him, he makes the first cuts into the large, untouched burl, blocking it up for the journey home. There, with chain saws and gouges, surface treatments and patience, he’ll coax striking organic sculptures from its grain and structure. Peterson embarked on his artistic path in Florida in the mid-1970s after a four-year stint as a Navy medic. Forgoing the security of a civil service career, he fell in with a charismatic retiree, a former film producer turned woodworker, who was developing a line of Hobbit-themed décor items formed from natural wood burls and topped with crowns of gilled coral fungi. Enlisted to harvest pine burls in Oregon for the woodworker’s new West Coast outlet, the Petersons jumped at the chance to migrate to the Pacific Northwest and be closer to Jean’s family. When an opportunity arose to rent a rustic cabin at Norma Beach on Puget Sound, they settled into what would become a 16-year stay. Their lifestyle “really re­inforced a personal aesthetic that was grounded in the natural world,” he adds. Earlier that decade, the Petersons and a friend – a photographer and amateur naturalist – had made ambitious explorations of the American landscape with camera, binoculars, and canoe. The imagery became a touchstone. Here, in the cultural orbit of progressive Seattle, the couple encountered the burgeoning craft movements of the day. Jean, a fiber artist, sold textiles at Pike Place Market to crowds of folk revivalists. On a former tree farm up the road, a fledgling Pilchuck Glass School was making waves. The pair began studying at Edmonds Community College. “It was a time, for both of us, to just hunker down, working on our crafts,” Peterson says. Then, in December 1979, Peterson saw a turned bowl by Ed Moulthrop on the cover of American Craft. “Seeing that magazine and reading the article – that’s when I realized the lathe was how I could get rounded, ceramic-like forms.” He commandeered his school’s lightly trafficked woodshop and developed solid turning skills. He soon was crafting elegant bowls and boxes that shared a booth with Jean’s fabric-wear at summer fairs. 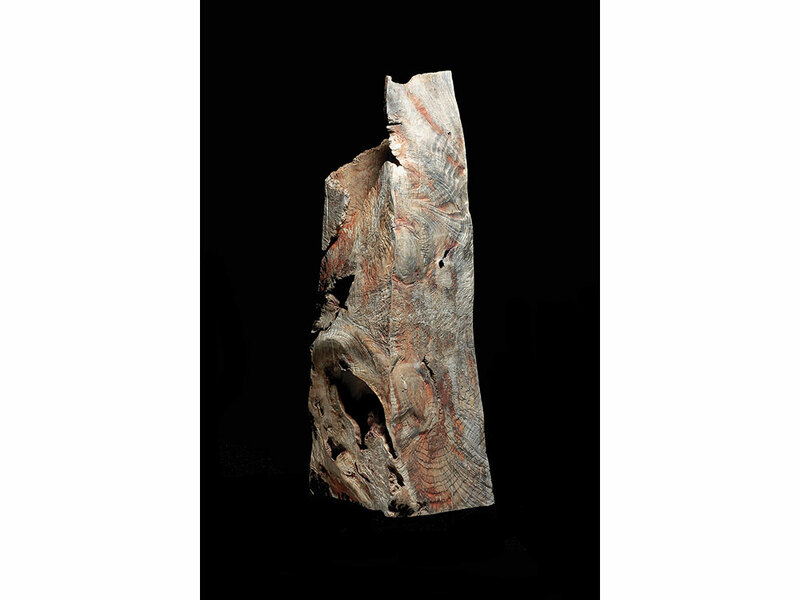 He began translating environmental imagery into his work, using wood’s grain and texture to express and reflect the natural world. 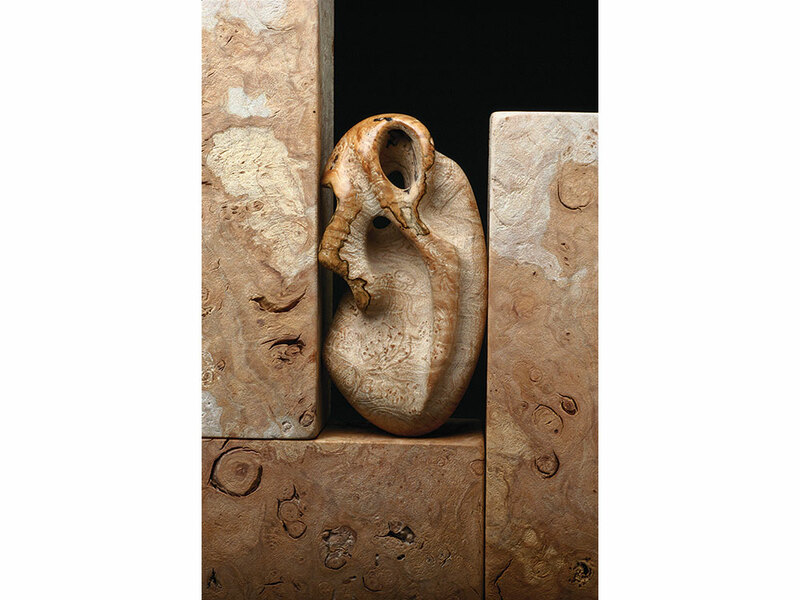 His Landscape series, beginning in the mid-’80s, retains the vessel form, but the emphasis on natural edges marks a distinct shift toward the sculptural. The lathe became a design tool, as carving, sculpting, and finishing took center stage. As his works grew more organic, Peterson found himself increasingly interested in process and spontaneous invention rather than realizing a designed product. He began using unseasoned wood, which shrinks as it dries, heightening grain patterns and creating rich surfaces. “Seeing the transformation green madrone burl undergoes, from when I’m done with it to what it looks like a few weeks later – you simply can’t ask for more out of a raw material,” Peterson says. 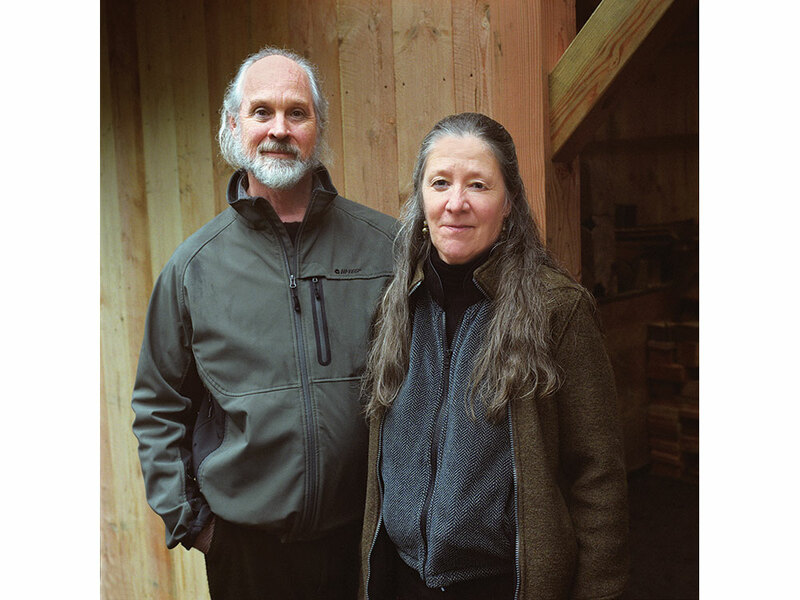 In 1994, the couple fulfilled a dream, relocating to the San Juan Islands north of Seattle, where they could afford to buy land of their own. In this remote environment, Peterson abandoned the lathe and surrendered his muse to wood’s natural inclinations. On a drizzly afternoon, Peterson stands in his “studio” – a clearing open to the skies set on one of the few level spots on the couple’s five acres of independence. Through colonnades of evergreens, you can spy the rounded hillocks of neighboring islands. 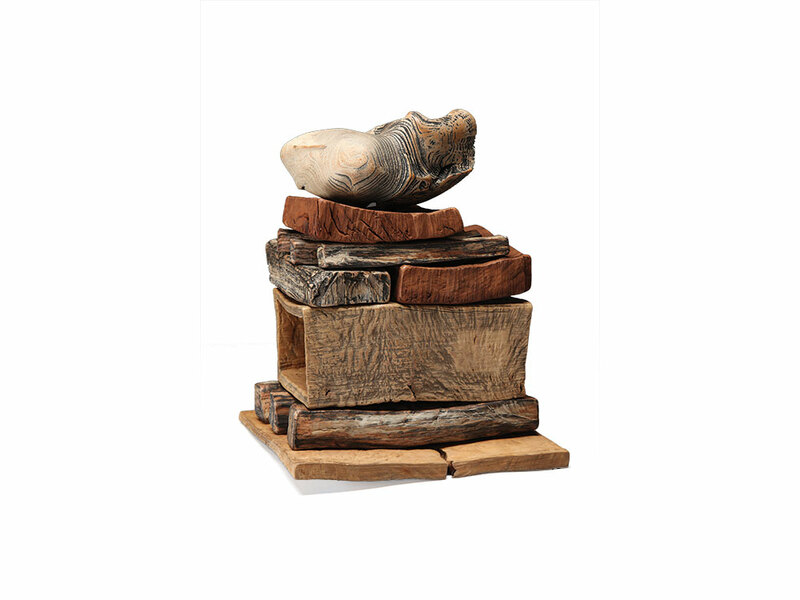 Here on Lopez, in a modest house, Peterson and his wife live a life of “voluntary simplicity,” an ethos made visible in the elemental purity of the sculptor’s most recent work. With assorted chain saws, Peterson cuts rectangular blocks from big burls, hunting for suggestive swaths. He then plunge-cuts into a mass and extracts a smaller, congruent block, leaving behind a thin-walled husk. Repeating the process until there is no more room to saw, he is left with a collection of hollow forms that will be the basis of his sculptures, as individual pieces or stacked assemblages bound together only by gravity. 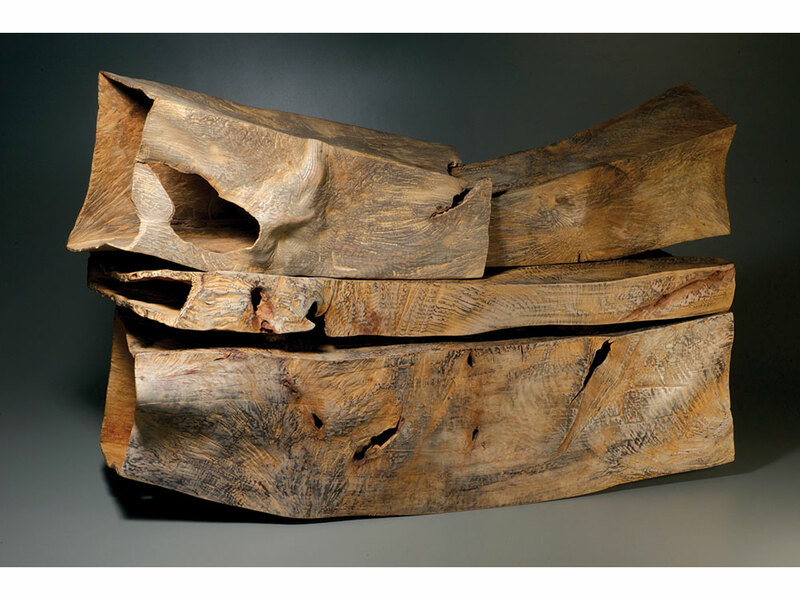 As the wood dries, it will check and curl, echoing geologic forces of uplift and erosion. “The next step – and what the work is really about – is my surface work,” Peterson says. He applies repeated rounds of sandblasting, bleaching, and pigmenting, using inks, kakishibu (persimmon tannin), and, more recently, clay. 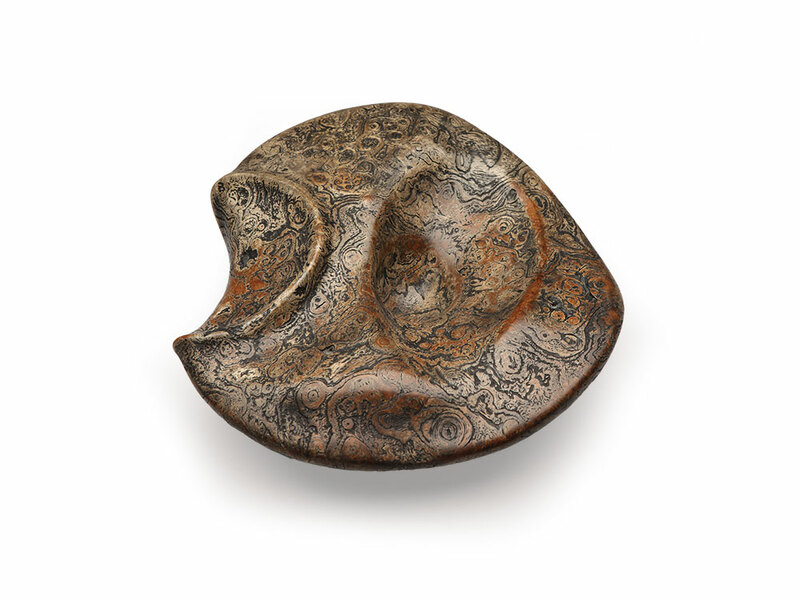 Peterson likens the weathering process to the natural forces of wind, sand, sun, and rain. Burnished to a lustrous patina, the hollowed timbers gleam like bones of the forest, relics of a natural order. In 2009, the Bellevue Arts Museum honored Peterson with a retrospective, “Evolution/Revolution,” which toured nationally. In 2011, his assemblage Coastal Stack V was purchased by the Philadelphia Museum of Art and in 2012 served as the poster image for “Craft Spoken Here,” a landmark exhibition that celebrated craft’s vitality as a form of visual expression. The sculpture looms like one of the rocky sea stacks rising not far off the Washington coast. It was one of his largest works to date, Peterson notes, 4 feet tall and combining more than a dozen elements. He plans to keep pushing those physical limits, expanding the scope of his work. He’s been doing more with cylindrical forms, bringing pieces up onto the wall, and can imagine, in the future, moving toward installations. Of late, he’s been making graphite rubbings of his surfaces, translating those evocative textures onto paper. 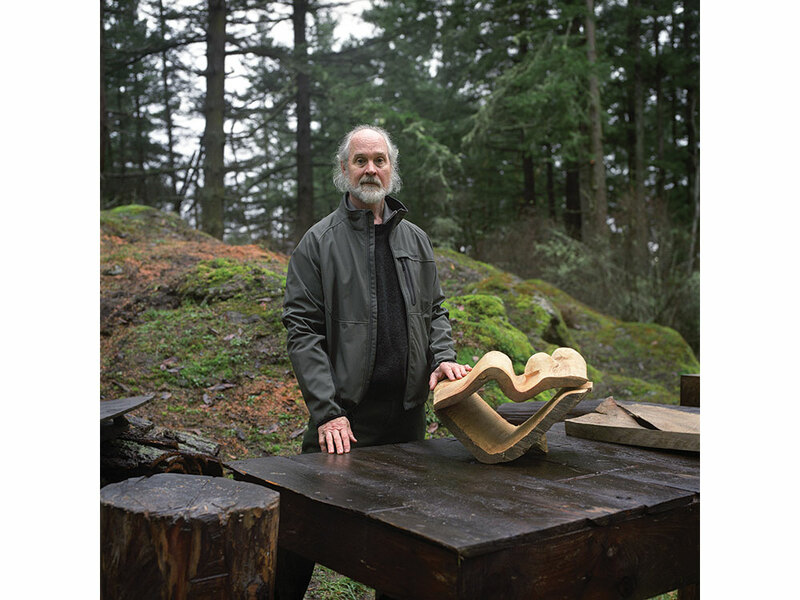 After 30-odd years, he hasn’t exhausted his relationship with wood – if anything, he sees more in it. 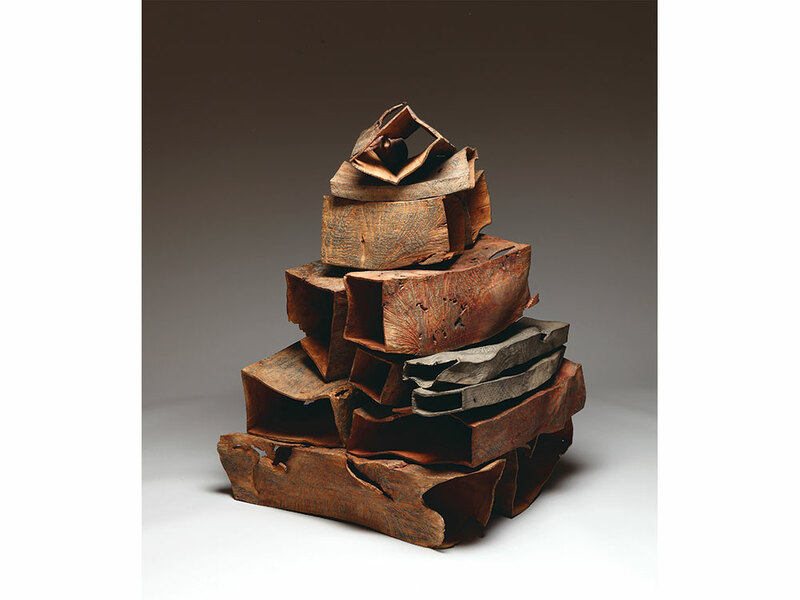 Michael Peterson’s work appears in “Scratching the Surface,” an exhibition of nine contemporary wood artists at Los Angeles’ Craft and Folk Art Museum through May 5. Jake Seniuk is an artist, curator, and the founder of Webster’s Woods, a museum without walls on Washington state’s Olympic Peninsula. 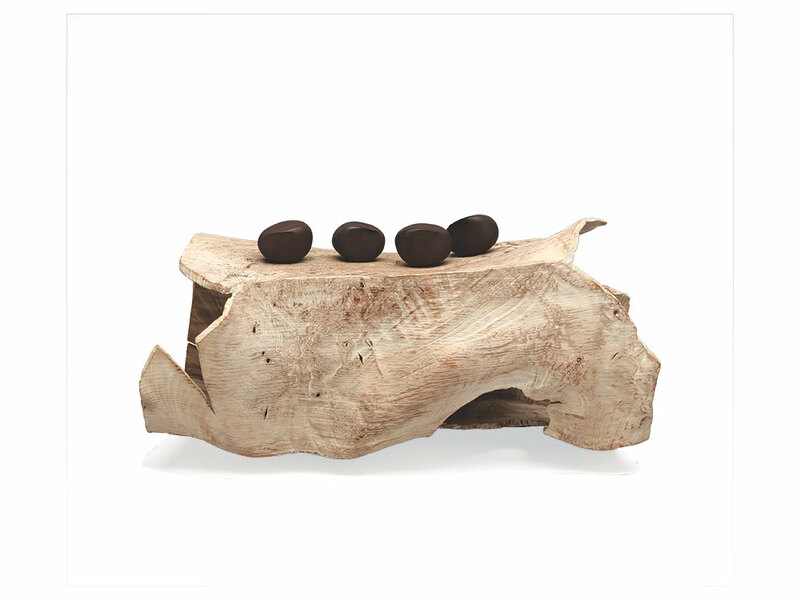 Landscape has driven Michael Peterson for decades, from his early turned vessels to his latest assemblages. 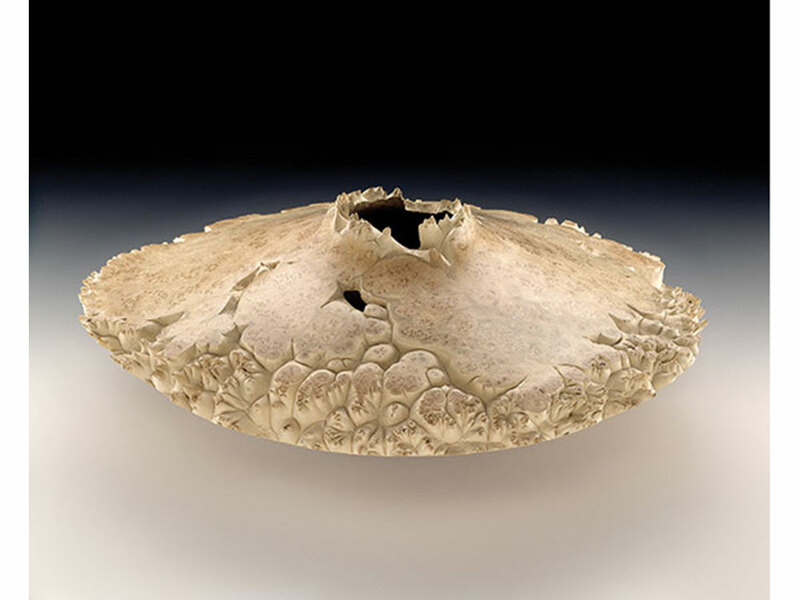 In Navajo Land (1987), of bleached and sandblasted maple burl, the natural edge of the vessel evokes a mesa. Wendell Castle's life seems as playful and practical as his furniture.